Person centred planning drives the evolution of Kindale’s services. 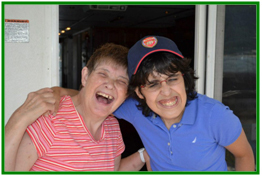 Person centered planning is designed to assist someone to plan their life and supports, enabling individuals with disabilities, or otherwise requiring support, to increase their personal self-determination and improve their own independence. Kindale’s staff work with individuals, their families and caregivers, to put the person centered plan into action, using the needs and dreams identified in the plan to guide the choice of services, supports, and life experiences that are appropriate and beneficial for each individual. and Specialized Services for youth and seniors.